On January 9, Secretary of State John Kerry issued a formal apology for the U.S. Department of State’s “Lavender Scare”—an internal witch hunt that cost at least 1,000 people their State Department jobs for alleged homosexuality during the 1950s and 1960s. 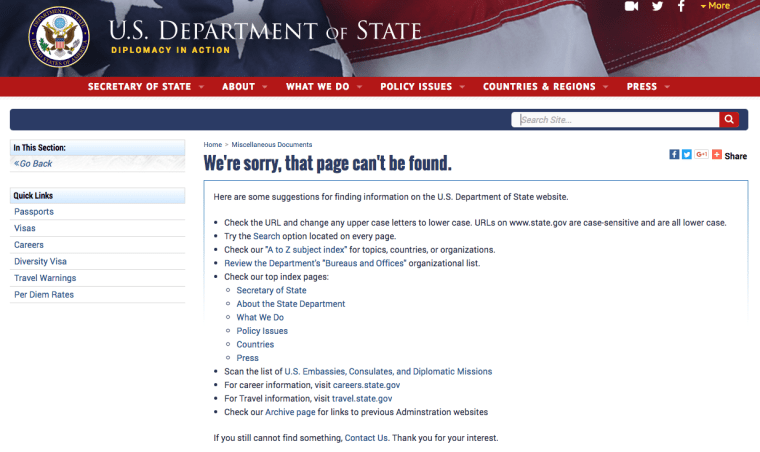 Just two weeks later, that apology—along with nearly every other mention of LGBTQ issues—has been removed from the Department of State website. NBC News emailed the State Department’s press office to ask why LGBTQ content had been scrubbed from the website, and whether such a move is temporary or permanent. In response, a State Department spokesperson stated via email, "As per standard practice, the Secretary's remarks have been archived," and included a link to the archived remarks. However, a search of the State Department's website reveals not much else has changed aside from the removal of LGBTQ content. “Secretary Kerry's apology to LGBTQ employees and their families who were targeted, harassed and fired set the right tone for the State Department, even if it couldn't undo the damage done decades ago,” HRC President Chad Griffin said in the statement. On Tuesday, it appeared that nearly all mentions of the acronym "LGBT" had been taken off the State Department website (the department typically did not include the acronym's "Q," which is used by some—though not all—in the LGBTQ community). Entering "LGBT" into the website’s search field resulted in numerous dead links where webpages used to house information about LGBTQ Pride month, LGBTQ refugees, LGBTQ human rights issues, human trafficking of LGBTQ people and the Special Envoy for the Human Rights of LGBT Persons. “In the past – as far back as the 1940s, but continuing for decades – the Department of State was among many public and private employers that discriminated against employees and job applicants on the basis of perceived sexual orientation, forcing some employees to resign or refusing to hire certain applicants in the first place. These actions were wrong then, just as they would be wrong today,” Kerry said in the January 9 statement. HRC and other LGBTQ advocacy groups also condemned the Trump administration for removing all mention of LGBTQ people from the White House website on the day of Trump’s presidential inauguration. On Friday, Lambda Legal CEO Rachel Tiven said the scrubbing of LGBTQ content was no surprise given Trump’s largely anti-LGBTQ cabinet picks. In addition to the State Department and White House removals, LGBTQ content has also been scrubbed from other federal agency websites. A report titled "Advancing LGBT Workplace Rights" was removed from the U.S. Department of Labor website, while other LGBTQ-themed webpages remained. LGBTQ pages on other federal agency websites appeared untouched and unaltered. The Department of Defense, Department of Health and Human Services, Department of Education and Department of Justice websites were just a few that still had LGBTQ content listed as of Tuesday morning. A request for comment was sent to the Trump campaign press office but did not receive an immediate response.